Is The "Fix-Up" The Best Kind Of Science Fiction Novel There Is? Everybody knows that short stories are where science fiction writers really get to experiment, and the most perfect pieces of narrative often happen at shorter lengths. But we also love to explore a world at the length of a whole book. So that makes the "fix-up" the best of both worlds, right? The "fix-up" is a novel that's constructed out of short stories that were previously published on their own. And a lot of classic science fiction novels were "fix-ups." Asimov's I, Robot and Foundation were both published as groups of short stories before becoming books. There's Bradbury's Martian Chronicles, too. There's also Jack Vance's The Dying Earth, and Leigh Brackett's Alpha Centauri or Die!. And, as frequent io9 contributor Andrew Liptak explains over at Kirkus, the master of the fix-up novel was A.E. Van Vogt, who wrote a ton of them. Including Voyage of the Space Beagle, and The Beast. This used to be one standard way to write a science fiction novel — publish a series of stories that all take place in the same world, and then knit them together into a book. Sometimes a great deal of revision happened, to turn the separate stories into a single narrative and make sure all the threads joined up. Sometimes, the stories remain pretty separate but there are links between them. By the end of World War II, new changes in printing technology brought the paperback novel to bear. In response, readers began to abandon the pulp magazine market for the paperback novel market. This left many science fiction authors caught in a hard place: Many had come to depend on the large number of magazines on the market that would pay them for their work, and as readership declined, so too did the places in which to publish original fiction. The result was an innovative solution: repackage a number of preexisting short stories by adding to or rewriting portions of them to work together as a single story. But there's also something kind of beautiful about a novel in stories — there's a reason why Sherwood Anderson's Winesburg, Ohio is one of the greatest story collections of all time, for example. You get more narrative "payoff" with a collection of stories that also forms a single continuous meta-story than you do with a single over-arching novel — because each story has its own conclusion, and yet the story builds towards a bigger resolution. And there's the fact that adventure fiction is usually better when it's kind of serialized. We love adventurers who get into one scrape after another. There's something to be said for a swashbuckling hero who doesn't stay in one place too long, or deal with one immediate threat for more than a dozen pages. The classic example of adventure fiction that's basically just a long string of short stories is Edgar Rice Burroughs, whose John Carter stories are all short episodes. 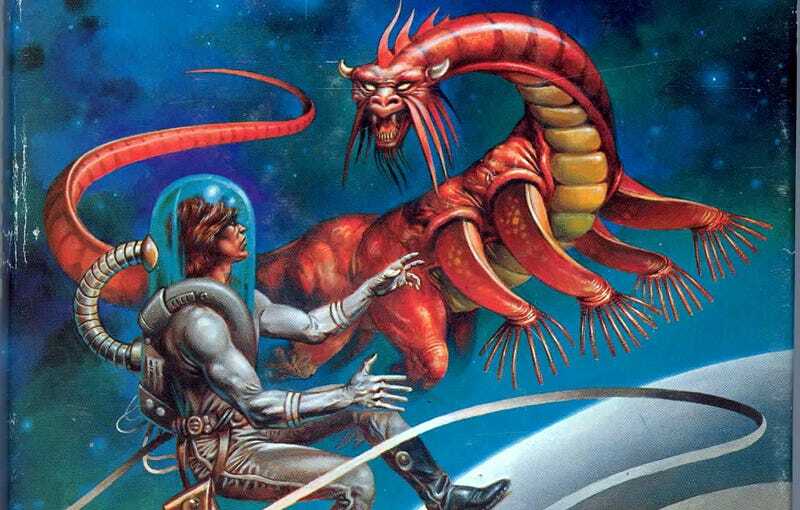 Wikipedia has a pretty huge list of science fiction and fantasy fix-ups, which include a lot of our favorite books. What's interesting is that the practice has continued until pretty recently, although it's definitely slowed down a lot in the past 15 years. Of the fix-ups on Wikipedia's list, the one that I've read most recently is George R.R. Martin's Tuf Voyaging, which is a highly entertaining collection of tales about one character, in which you can see Martin's perspective on Tuf change over the relatively long period he was writing about the "ecological engineer." And yet, it's pretty clear that the "fix-up" has been in decline somewhat over the past few decades, possibly due in part to the shrinking number of short fiction markets and the fact that nobody makes a living writing short fiction any more. What's more common nowadays is to write a single short story or novella, and then expand it out to book length once it gets awards or widespread notice. That's what Orson Scott Card did with "Ender's Game," an award-winning short story. Card took the story, published in Analog in 1977, and expanded it to book length. Similarly, Paul Melko's novel The Walls of the Universe started out as an acclaimed novella in Asimov's Science Fiction. And as both those books demonstrate, this can work really well — although sometimes, a story's natural length is just shorter, and trying to expand it to book-length can be a mistake. But I still love the idea of a novel made out of short stories, and Jennifer Egan's A Visit from the Goon Squad proves that lots of other people do, too. David Mitchell's novels tend to be thinly disguised story collections, linked by some sort of meta-arc, as well. I would love to see more short fiction magazines and anthologies experimenting with publishing linked stories by a single author in the same world, and more ways to encourage writers to create more worlds out of shorter narratives.